In a time when college tuition is on the rise, and with so many high school graduates pursuing college degrees, it’s important for students to go for majors that will pay off in the long run. The Careertrend.com Hardest Working Colleges Report uses publicly available statistics to estimate how much grads are likely to work once they enter the working world. The analysis includes 1,731 four year institutions in the United States. Where are the Hardest Working Colleges in the US? What did their students major in? The Maine Maritime Academy ranks as the number one hard-working college in America at 44.2 hours per week. Filling out the top 12 are other maritime academies, trade and engineering schools. These colleges rank highly due to the long hours reported by workers holding engineering, agricultural and culinary degrees. On the flip side, The Julliard School ranks as the least hard-working school at 36.0 hours per week. Alongside it are other arts- and performance-focused institutions. While the musicians and performers of Julliard may log long hours in the practice room, statistics indicate that music and arts majors tend to report working the lowest numbers of work hours after graduation. While the difference between 44.2 and 36.0 work hours per week may seem slight, it amounts to a full work day per week. 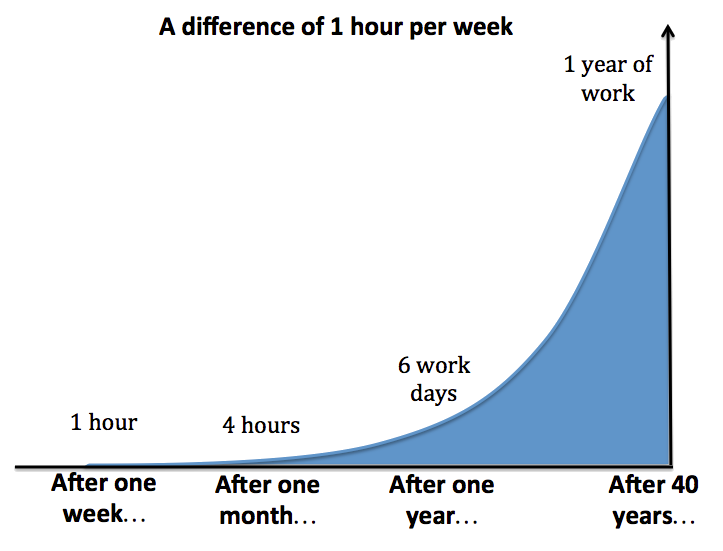 Over the course of a 50-week year of work, that's 410 hours or over 10 standard work weeks. In a career of 40 years, this amounts to over 16,000 hours or about 8 extra years of hard work. The reason why some colleges rank higher than others is that some jobs are more in-demand and work longer hours than others than others. For example, the most in-demand tech roles are for engineers, while music majors experience fewer job opportunities and lower pay. Which majors pay the most? Which majors work more hours? What About the Least Hard Working? Is there a relationship between hours worked and pay? According to our analysis, there appears to be a strong relationship between hours worked and pay. This chart shows the top and bottom 100 hard working colleges. Harder working colleges also tend to have graduates with higher pay. Each year, millions of Americans report hundreds of facts to the U.S. Census in the American Community Survey (ACS). This includes information like level of education, field of study, hours worked and income. The Census Bureau makes much of this data public through the Public Use Microdata Sample (PUMS) data set. The National Center for Education Statistics (NCES) collects information from all postsecondary institutions including the numbers of degree earners and their fields of study. This information is available through their Integrated Postsecondary Education Data System (IPEDS) system. As an initial step in this analysis, we matched degree classifications from the NCES data to Census data. For instance, in one data set, the major may be called "plant science," while in the other it is called "botany." With majors matched across the data sets, we proceeded with data analysis. As an extra step, we excluded people working or earning very little by restricting it to those with self-reported income above $10,000. Based on the unique profile of major fields at each institution, we then estimated average hours worked for grads, based on how many hours were reported by holders of those degrees. We also looked only at colleges awarding over 100 four-year degrees per year to ensure sample size is sufficient. We also estimate salaries for degree holders in each field of study using the Census data. We restricted the salary estimate to only include workers whose highest degree is a bachelor's, excluding those with master's, doctoral or professional degrees. Salaries are estimated using the unique profile of majors awarded at each college. For more information about methodology, click here. The Iron Bowl is an American college football rivalry game played annually by the football teams of the two largest public universities in the U.S. state of Alabama, the Auburn University Tigers and University of Alabama Crimson Tide, both charter members of the Southeastern Conference (SEC). The series is considered one of the most important football rivalries in the annals of American sports. The Michigan–Ohio State football rivalry, referred to as The Game by some followers, is an American college football rivalry game played annually between the University of Michigan Wolverines and the Ohio State University Buckeyes. It gathered particular national interest as most of the games from the 1970s through the mid-2000s determined the Big Ten Conference title and the resulting Rose Bowl Game match ups, and many influenced the outcome of the national college football championship. The game was ranked by ESPN in 2000 as the greatest North American sports rivalry. The Army–Navy Game is an American college rivalry game in college football between the Army Black Knights of the United States Military Academy (USMA) at West Point, New York, and the Navy Midshipmen of the United States Naval Academy (USNA) at Annapolis, Maryland. The Army–Navy game is one of the most traditional and enduring rivalries in college football. The Red River Shootout, is an American college football rivalry game played annually at the Cotton Bowl stadium in Dallas, Texas. The participants are the Oklahoma Sooners football team of the University of Oklahoma and the Texas Longhorns football team of the University of Texas at Austin. The series is one of the major rivalries in NCAA football and in all of American sports. The Harvard–Yale football rivalry is renewed annually with The Game, an American college football contest between the Harvard Crimson football team of Harvard University and the Yale Bulldogs football team of Yale University. The Big 12 Conference is a ten-school collegiate athletic conference headquartered in Irving, Texas. It is a member of the NCAA's Division I for all sports; its football teams compete in the Football Bowl Subdivision (FBS; formerly Division I-A), the higher of two levels of NCAA Division I football competition. Its ten members, located in Iowa, Kansas, Oklahoma, Texas, and West Virginia, include eight public and two private Christian schools. The Big East Conference is a collegiate athletic conference that competes in NCAA Division I in all sports except football, which is not sponsored. The conference has been officially recognized as a Division I multi-sport conference. The Big Ten Conference, formerly Western Conference and Big Nine Conference, is the oldest Division I collegiate athletic conference in the United States. Despite its name, the conference consists of 14 members (as of 2018). They compete in the NCAA Division I; its football teams compete in the Football Bowl Subdivision (FBS), formerly known as Division I-A, the highest level of NCAA competition in that sport. The conference includes the flagship public university in each of 11 states stretching from New Jersey to Nebraska, as well as two additional public land grant schools and a private university. The Pac-12 Conference is a collegiate athletic conference that operates in the Western United States, participating in 24 sports at the NCAA Division I level. The conference's 12 members are located in the states of Arizona, California, Colorado, Oregon, Utah, and Washington. They include each state's flagship public university, four additional public universities, and two private research universities. The Ivy League is a collegiate athletic conference comprising sports teams from eight private universities in the Northeastern United States. The conference name is also commonly used to refer to those eight schools as a group beyond the sports context. The Maine Maritime Academy is located in tiny Castine, Maine on the rocky New England coastline. It trains over 200 students per year, largely in marine-related fields. Its students clock in for an estimated 44.2 hours per week. Though its graduates often become sailors in the U.S. Navy, the Academy is a public university run by the state of Maine and graduates find work in many places, both land and sea. United States Merchant Marine Academy is an official service academy of the U.S. armed forces. Located in Kings Point, New York (not far from Queens), it awards over 200 degrees per year and its studentsclock an estimated 44.1 hours per week. Le Cordon Bleu-Scottsdale was the only one of the Cordon Bleu institutions to qualify for our ranking, having over 100 four-year degrees awarded per year. All of its students graduate with a culinary degree and clock an estimated 43.9 hours per week. Vaughn College of Aeronautics and Technology is located in Queens, New York City. It was a recipient of NASA's 1988 Space Grant program. Its graduating class of 109 was enough to be included in our analysis. Students at Vaughn earn degrees in transportation and engineering and clock an estimated 43.5 hours per week. Embry-Riddle Aeronautical University-Worldwide is part of the Embry-Riddle university system which is located in Daytona Beach, Florida. Students may take flight school alongside the academic curriculum. Its students clock an estimated 43.3 hours per week. Massachusetts Maritime Academy academy is located in Buzzards Bay, Massachusetts, a suburban community near Cape Cod. Its students clock an estimated 43.2 hours per week. Abraham Baldwin Agricultural College is located in Tifton, Georgia, approximately halfway between Atlanta and Orlando, Florida. Its predominance of agricultural majors pushes its work hour estimate to 43.1 hours per week. Colorado School of Mines in Golden, Colorado outside Denver specializes in engineering, especially related to natural resources and mining. Its hard working graduates clock an estimated 43.1 hours per week. SUNY Maritime College is the third entry in our top 12 to be located in the state of New York. It is located in the Bronx, a borough of New York City, just across the East River from number four and number two on our list. Its students clock an estimated 43.1 hours per week. The fifth entry in our top 12 to be a maritime academy, the Cal State Maritime Academy is located in Vallejo, California on a northern estuary of San Francisco Bay. Its students clock an estimated 43.0 hours per week. Kettering University is a private, non-profit university in Flint, Michigan. It was founded by a General Motors engineer in 1919 and specializes in engineering and computer-related fields. Its graduates clock an estimated 42.9 hours per week. Rose-Hulman Institute of Technology is located in Terra Haute, Indiana. Its graduates mostly earn degrees in engineering fields and clock an estimated 42.8 hours per week.